In a project aimed at improving the security situation in the country through technology, 1,800 cameras will be mounted in the streets of Nairobi and other public places to monitor what goes on around the city. 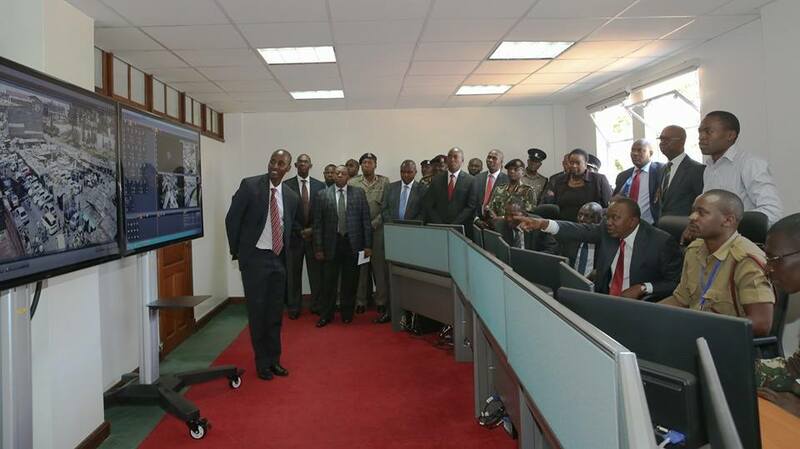 This announcement was made today by President Uhuru Kenyatta while touring the National Police Service headquarters. Accompanied by his Deputy William Ruto and Interior Cabinet Secretary Joseph Nkaissery The three were assessing the progress made so far in the implementation of a secure communication and surveillance system in the country. The project harnesses the power of technology and will enable law enforcement officers to effectively coordinate and deploy their resources in response to threats to national security. The state of the art system comes with video surveillance, digital radios that will replace walkie-talkies currently used by police, video conferencing system, central command for the communication system and a mapping system. In addition to the cameras, 7,600 police officers will be equipped with the multi-media radio communication devices during the first phase of the project implementation. Private property owners who want to enhance security within their premises will also be allowed to share surveillance feeds with the police when this project is launched. This according to President Uhuru Kenyatta will help improve security in private residences that could be away from the cameras that will be mounted to monitor public places.